For over 25 years, the Esri Schools Program has created or collaborated on a variety of instructional materials. Perhaps you recognize some of these. Maybe you've even used some of them. Carl Rogers' Diffusion of Innovations is a theoretical model that describes how ideas (and technologies) can be spread over time in a social system. The innovation, communication channels, time, and a social system are all necessary to spread an idea according to the model. At some point, as an idea continues to diffuse it can reach “critical mass”. People in the social system are described based on their roles as either: innovators, early adopters, early majority, late majority, or laggards. Each group of people have typical actions within the system – from the rate at which they adopt a new technology to how they share that adoption. In this way, each group has strengths and weaknesses that must be planned for. For the interested reader, there are several additional elements (e.g. Moore's Chasm, Maloney's Rule) to be considered in the model; it is worth an extended read. Imagine this curve representing the population of all U.S. school teachers – and the major groups they might fall into with respect to technology adoption. Historically, our materials have been great at supporting innovative teachers and early adopters of technology. Our materials were great at helping people learn our technology – especially useful for application in project focused learning. Unfortunately, as many of us know, project based learning is not all that commonplace in U.S. schools. It takes time, resources, an experienced educator – and sometimes even runs counter to a school’s standards-based priorities. This tends to relegate project based learning to the realm of innovative teachers. For this reason, in 2014, we began developing GeoInquiries™ - materials targeting the receptive mainstream (Early Majority) to support the Esri ConnectED Initiative - a part of the Obama White House ConnectED Initiative. Representing nearly a third of the teaching population, the segment's use of GIS quickly surpassed the use of GIS in project focused applications in the classroom. While our mainstream solutions, like GeoInquiries and Mapping Our World directly serve the Early Majority of the receptive mainstream in the teaching community, more advanced users, namely the Early Adopters, tend to blend pre-built content with custom classroom activities, while the Innovators tend to work with local and custom projects. Keep in mind, these are generalizations about instructional behavior. They don't describe the whole story of GIS use in classrooms. Today, we commonly see fifty-thousand web hits a month for these mainstream activities and maps. Moreover, with the release this past summer of three new collections (American Literature, Mathematics, and World History) we now offer mainstream materials for all core disciplinary areas taught in school - with added support in the science and social sciences. Does it work? We surveyed teachers six months after a short, regional workshop event last year and found that approximately 50% of teachers are teaching completely from or blended with pre-built materials like GeoInquiries. A smaller group of Innovators (~18%) continues to blaze forward with customized curricula and local projects and other adaptations. 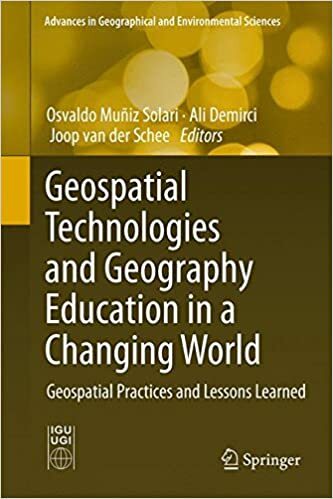 Ideally, we'd love to see everyone teaching around local project work, but in the meantime, a significant body of educators is now teaching with GIS in the standards-based, mainstream classroom. The three new 2017 Esri GeoInquiry collections are now available. Although the field testing is ongoing, you’ll find the 45 new maps and activities and over 250 new data services supporting mainstream K12 educators posted. Feel free to share: esri.com/geoinquiries .